I make a lot of quilts out of Crown Royal bags for people who have collected them. They make really nice Christmas gifts or Father’s Day gifts. Most people are familiar with the purple bags, but Crown Royal makes some specialty whisky and they use different colored bags for those. If someone includes specialty bags with their purple ones, I try to incorporate them into the quilt in a symmetrical manner. However, depending on the size quilt they are having me make, there may not be an exact center to put a specialty bag in. 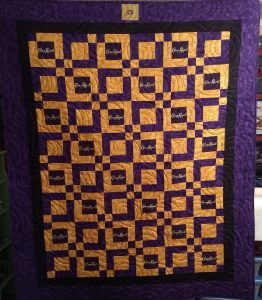 I recently did a small lap quilt for someone who had one gold bag and the rest were the usual purple. Since this particular sized quilt does not have a center square, I decided to put the gold bag in the center of the top quilt border. I think it turned out well and will be a good option to use in the future.